It's been awhile since I've taken part in Presto Pasta Night over at Once Upon a Feast. 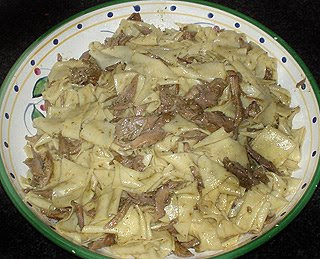 Last Saturday was my Birthday and as a special treat we made homemade pappardelle with duck sugo adapted from Lidia's Italy, by Lidia Bastianich. I thought this would be a great submission for this week's pasta round-up over at Chew on That. Trim excess skin and fat from duck legs. Heat 2 cups of stock and pour over dried porcini. Let soak for 1/2 hour or longer. When the mushrooms have softened, drain and squeeze them, reserving all the soaking liquid. Chop porcini into 1/2 inch pieces. Using a food processor, mince the onion, celery, garlic and all the fresh herbs for 20-30 seconds, to a moist paste. Set a big pan over medium high heat and film the bottom with 2 Tbs of olive oil. Lay all the duck legs in the pan, skin side down. Sprinkle 1/2 tsp of salt and sizzle for a couple of minutes until skin side is brown. Flip and continue cooking, adjusting the heat and moving the meat as needed, until nicely browned all over. Remove meat to a bowl. Return saucepan to the heat and scrape in all of the paste from the food processor bowl. Stir it all over the hot pan, scraping up the browned bits, for 2 minutes or so, until it is nearly dry and toasting. Return duck legs to the pan and tumble in the paste. Scatter in the chopped porcini, stir and toss with the legs, and cook several minutes until everything is sizzling. Pour in the wine, raise the heat and turn the duck until the wine has cooked away. Pour in the porcini liquid and sprinkle another 1/2 tsp of salt. Heat to a boil, turning duck legs. Set the cover ajar and cook at an actively bubbling simmer, turning ducks frequently. Add stock every 20 minutes so the liquid level is about 2/3 of the way up the meat. After 1 1/2 hours or so, when the duck is tender, turn off the heat and let the duck cool completely in the covered pan. Remove duck from the pan and pull all the meat off the bones. Tear the meat into bite size pieces. Put the meat back in the sauce and heat for 15 minutes. Meanwhile cook pasta. Lift pasta from pot and lower into the sauce. Toss over and over to dress thoroughly. If the sauce is too thick add some pasta water. Turn off the heat and toss pasta with the grated cheese; drizzle some olive oil over the top and serve. Happy Birthday and thanks for sharing a fantastic dish with Presto Pasta Nights. Looks like a lovely way to celebrate your birthday!